Jill Sissel Music Video with Liz Ficalora Playing Drums " "Thinkin Bout Home"
Jill Sissel Music Video with Liz Ficalora Playing Drums "I Believe"
Original Wedding Song - "I Choose You"
Original Wedding Song - "Take A Picture Of This"
Stevie Nicks, Heart, Tom Petty, Eagles covers performed with energy and fun is just the start to a powerful duo available for Corporate Events, Weddings, Birthdays, Anniversary's, Party's, Clubs, Fairs and Festivals. If you like classic rock and a comfortable volume, you will enjoy this duo. Original songs written and performed for your wedding. 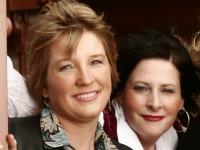 Listen to Sound Clips "I Choose You" or "Take a Picture Of This"
The Paint Sisters have been together for the past 10 years with multiple albums to their credit. Jill Sissel is an award winner songwriter ,exceptional guitarist and producer of multiple albums. Liz Ficalora is a published author and award winning jingle writer, teacher and producer who creates the rhythmic feel for all the songs. Together they create a full sound with harmony vocals.